Not really a class of gladiator but more of a status, a rudiarius gladiator was one that had received a rudis, a wooden sword which marked that this gladiator was a free man. Despite having earned their freedom through his combat in the amphitheatre, what marked this gladiator apart was the fact that they chose to continue fighting, this is what made them a rudiarii. You could also be called a rudarius or rudiarii if you worked within the gladiator world, for example trainers may be called rudiarii if they continued to train after they had earned their freedom. The same for managers, match referees and anyone associated with the sport in some capacity. Because of the fact these gladiators had already earned their freedom but continued to fight, the crowd were always warm to these gladiators. To earn your freedom and continue shows many things, bravery, love for combat, some might even say stupidity. but for the rudiarii for whatever reason they did not want to leave the amphitheatre, at least not quite yet, and not in this way. 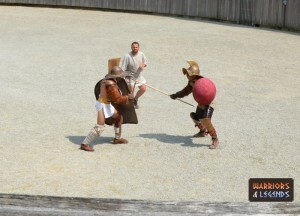 A rudarius gladiator armed with a spear fights fights with a lesser experienced gladiator. Through combat and success the rudiarius gladiator had earned their freedom, and now as a free man but still willing to fight, they brought a level of experience to the amphitheatre. With a track record of likely success there was likely a confidence in a rudiarius gladiator that was hard to match by many other gladiators. The answer to this question is not so straight forward, there are in fact many answers to it, which we can explore below. A free man might continue to fight for money and financial gain. Not all successful gladiators had paid of their debts. Alternatively it could be they wanted to use their status to earn bigger money in the amphitheatre, and not only retire, but retire well. The fame is another reason for a free man to continue fighting, the very popular gladiators were highly revered and lived out their days with a certain level of fame that was likely addictive to them. For this reason, we probably saw a lot of rudarii return to the amphitheatre to rekindle their glory days in the spotlights. The rudis was a symbol of freedom to the gladiators, and was typically a wooden sword that was awarded to them. This symbol marked their status as a now, free man, but it was told that the gladiator should carry this with them at all times, to ensure they did not revert back to slavery. A rudis like every rudiarius gladiator would have to own and also keep on his person at all times. These veterans of combat were some of the most popular with the ancient roman crowds and rightly so. Having already earned their freedom through their combat skills, these gladiators chose for whatever reason to continue their sport to the cheering of the crowds.